After yesterday evening's discovery, tonight, I'm going light-hearted and personal. Megan and I have a yearly tradition of taking pictures of us jumping. These are so fun to do, everyone should really try it, you'll have a ton of fun, and the results can be quite interesting. And more about us. We've decided to stay in Columbus. We're renting right now and our lease ends in August, so we'll be looking to buy a house soon, hopefully around Worthington for those of you that know Columbus. We will keep you updated about our house search, it really is very exciting. Oh yeah. Here is last year's Jumping Post! Mary-- Well, technically I've never said my age, I just mentioned that my mom has been my mom for 29 years. I think you must have done some clever math or something! This almost makes me envious. I am bothered, more or less, with rheumatoid arthritis and it has been hurting pretty bad. I guess it is the rain moving in. Anyway, I can hardly walk and then saw this and was just blown away that you guys can leap like that. Got my first pictures, yesterday, of a Baltimore Oriole. I got 367 pictures and it took all day. One is on my birds blog. 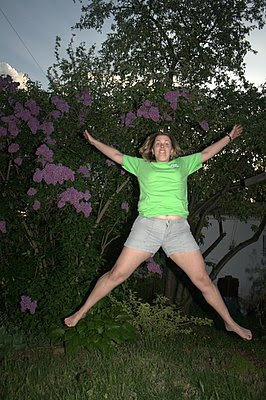 Thats how I feel now that winter is over and the warm weather is here, yahoo! Tom: You to are great jumpers. My grand kids could jump like that but I wouldn't try it. Abe- Great images of the Oriole, I wish we had those in our yard, I don't think it would be out of the question for one to visit. Leaping is fun, I'm going to enjoy it while we can. Hope all is well as soon as the front passes through! Yes, I know exactly what you mean. Finally you guys are getting spring. We had tickets to come up to Maine this weekend, but with the demise of Skybus, our plans were squashed. We'll be up your way in August. Lynda, we laugh a ton. It is great fun, it is definitely going to become a year tradition! Thanks for the luck with house search, we start tonight! We'll be meeting with our realtor and looking at houses. From hopping mad to jumping for joy ... a good transition. I reckon I can still jump, but you'd better be using a fast shutter speed if you want to catch me airborne. Good luck with your house hunting. Jo was more committed to buying our first house than I. One day while she was out grocery shopping she called and informed me she was buying a house and wanted to know if I wanted to come look at it before she made an offer. Marvin- That is hilarious. That sort of reminds me of my mother-in-law actually! She is not afraid to take advantage of a good deal when she sees one. 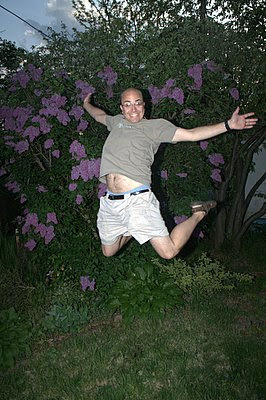 Alua- Thanks for stopping by and commenting, jumping is great fun, hope you stop by again. How fun! Good times I'm sure! The only thing that could make this better is if you had on your Happy Harbor shirt!